This apartment is part of a farmhouse in the heart of Tuscany. 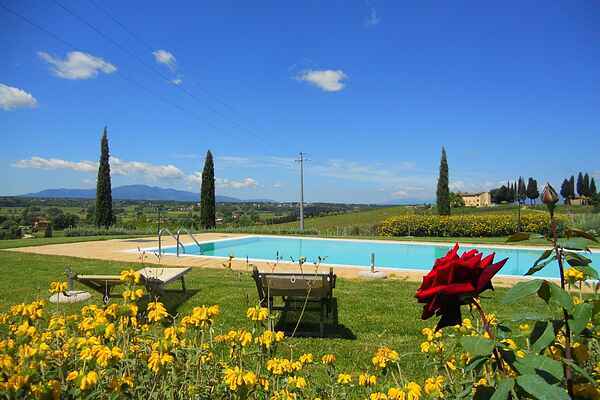 It is a family business in a strategic location for visiting Tuscany's most important cities without having to sacrifice a relaxing, natural environment. Guests have access to a scenic swimming pool with a Jacuzzi and children's pool, a boules court, mini golf, a volleyball court, a playground, a barbecue, and a pizza oven. The farmhouse is divided into 8 apartments, arranged into two different homes. This farmer's home, with its distinctive \"tower\", can be seen from the approach along the lovely road, lined with cypress trees. In addition to the surrounding garden, each apartment has a rustic, tiled terrace, perfect for evenings spent unwinding with a glass of wine, while the children enjoy playing between the olive trees on the lawn. Each apartment is tastefully decorated in a rustic Tuscan style, outfitted with old-fashioned, exposed beam ceilings, a well-furnished kitchen, and a terrace / personal outdoor area with a sunshade, table, and chairs for dining. The location is only 1 km away from the centre of Stabbia. It is a convenient place to begin one of many possible outings, as the region is extremely rich in culture and entertainment. Cerreto Guidi is also in the area, where you can pay a visit to the famous Villa Medicea. The city of Pisa is 50 km away, where you can visit the Tower of Pisa, of course, but also spend a wonderful day at the beach. Also just a few km away are the Monsummano Terme, with the Grotta Giusti, where you can spend a day relaxing at the spa. The Pinocchio Park in Collodi is also great fun for the little ones. During the summer, we always look forward to the sagras, summer festivals where products typical of the region, such as the San Miniato truffle, are offered.